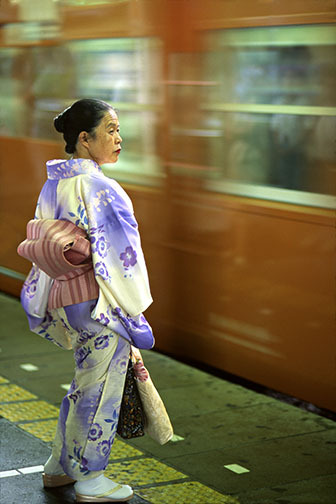 This entry was posted in Photography, Thursday Picture of the Week, Travel and tagged contrasts, cultures, japan, jeffrey aaronson, kimonos, photography, photojournalism, tokyo, travel by Becky Green Aaronson. Bookmark the permalink. Sorry to comment on this a little after the fact, but I’m so glad you shared the origin of this picture. I remember looking through all of the pictures you posted on your very first blog and this one captured my imagination. Her outfit, her expression, her formality seemed to barely tolerate the quickly moving world around her. And yet she does not seem at all out of place! Wonderful, Becky! Loving your blog and can’t wait for your book. Stephanie, so glad to see you dropped by my blog. It’s never too late to comment. I appreciate you taking the time out of your busy day to do it. You might also enjoy tomorrow’s picture of the day–especially since there will be a caption contest where I’ll be giving away a $20 Amazon gift card. I hope you’ll take part. Should be fun. Based on your beautifully-written comment, I bet you’d come up with a good one. Would love to write as well as this photographer can shoot! A truly amazing photograph. He’s an artist with the camera, and you’re and artist with the words. Thanks, Jessica. And you are an artist with the way you make people feel. Smiling right now! That is a great photo, as all of his are. I was just wondering if he asked the woman to turn for the profile? Did she even know he was shooting her? And I read he only took 2 photos. Is that right? No, he never spoke with the woman, and in fact she wasn’t even aware that he was photographing her. He just moved to get the angle he thought would work best. And yes, he only had time for two frames. Once again, had to comment. I was at a very poor home in the Philippines in the 1970s. I was a smoker then and lifted a carbage can lid to flick my cigarette ashes. The dear owners of the home quickly stopped me and I saw the entire garbage can (large aluminum type) was full of rice. That was basically all they ate and all they had to eat. They had no room for a garden and no animals for meat. I’ll never forget the few days I spent with them. They were precious and survivors. Yes, it’s amazing what we take for granted in this life, rarely understanding how lucky we are until we experience something like this. I am just awed by all the beautiful photographs in this project – from the Rice Temple to the food that is made from rice. All of Jeffrey’s photos move me. I don’t know if you experience this, but when I would see my husband’s work, pieces some long or some short form, I would fall in love all over again because of the creativity of the person. Thank you so much for sharing these.. This was a wonderful assignment for Jeffrey, and one I loved editing and captioning because the images were filled with such cultural richness. One of the benefits of my job (and my partnership, of course!) was that I always learned something when Jeffrey arrived home from a project. Who knew rice was so significant in so many ways? And yes, like you, I am quite attached to his photographs. I’m glad you are enjoying his work. Thanks for commenting!